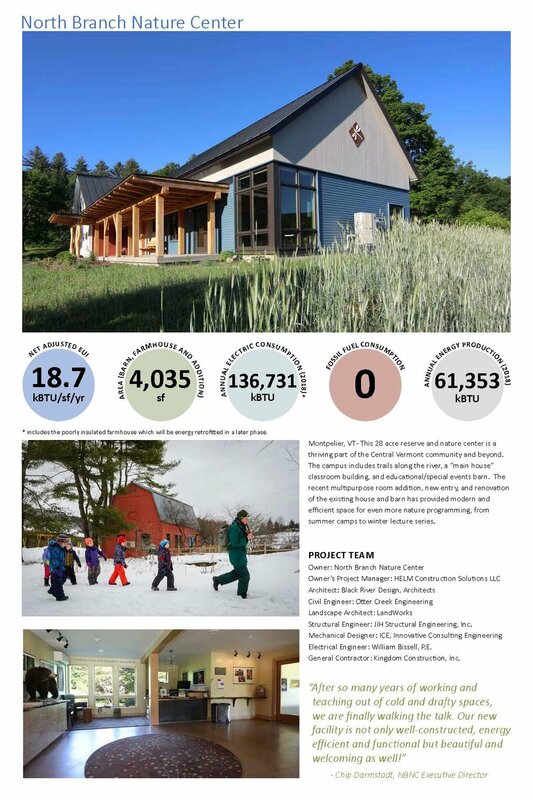 The North Branch Nature Center in Montpelier, Vermont was awarded a 2019 Going Greener Award and People’s Choice Award by the Vermont Green Building Network at the annual Vermont Green Building Gala on March 28th. This statewide competition recognizes exemplary residential and commercial buildings that meet the highest standard of demonstrated energy performance. The Going Greener Award is given to buildings with energy use intensity at least 25% below the regional average energy use for buildings of the same end use and incorporating other sustainability features. HELM Construction Solutions served as the Owner’s Project Manager. The North Branch Nature Center project included renovations to two existing buildings and a high performance addition to the existing Farmhouse. Phase One included renovations to the existing Barn that turned a barely heated and insulated space into a licensed pre-school facility with bathroom, kitchenette, ADA-accessible entry and natural playground space. Phase Two included the construction of a multi-purpose classroom and events space, with connecting reception area, a welcoming front porch, and ADA-accessible entry. Renovations to the existing Farmhouse included removal of the oil-fired furnace and installation of a ducted air source heat pump system. Phase Three (not yet completed) will include an energy retrofit of the Farmhouse with improved air sealing, insulation, new windows and doors. The site is powered by a 21 kW DC (15kW AC) ground mounted solar photovoltaic array. Other features include 28 acres of nature trails, a pollinator garden, an electric vehicle charging station, and water-saving fixtures throughout. The renovations eliminated all fossil fuel use on-site while also doubling the available square footage of program space. The resulting energy use is only one-third of a typical educational or office building, and approximately half of the electricity used on site is offset by the solar array. Once the energy retrofit of the Farmhouse is complete, the site is expected to be Net Zero. Fundraising is currently underway for Phase Three, which is expected to be completed in Fall 2019. The North Branch Nature Center welcomes a wide variety of thousands of visitors each year, from children participating in Forest Preschool and summer camps, to elders attending birdwatching walks, to families growing food in the community gardens, to teachers attending summer graduate-level courses.